It isn't often that you will descend a route before you ever climb up the thing. However when I climbed the Lesuer route on the Dru a few years back, the easiest and safest descent is rappelling the Dru Couloir Direct. It was dark and whilst hanging in the air, due to it's steepness of the route, only the beam of my head torch would light up small sections of the route. I couldn't imagine how big your forearms would have to be to climb something this wild. Turns out not not big at all, cause Calum and I climbed it the other day! Calum checking out the Dru the night before. 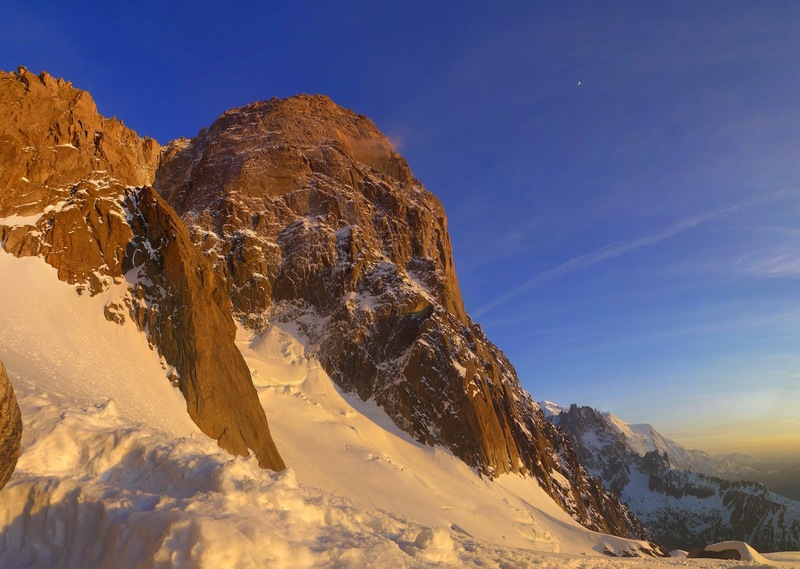 The Dru Couloir is such a striking feature, however it can only been seen from an angle. Most easily seen from the top station of Grandes Montes. Though you don't really get the true value of it until your within it's grasp. Even from Grandes Montes you still can't quite see the main difficulties, which is actually quite unique scenario for the Mt Blanc Massiff. Most of the time you can see the whole of a route from a far with out actually having to be on the route itself. see the start of the route. The route can be split into 3 sections. The 300m approach slopes, which consist of 60 degree ice that curve up to the right and brings you to the base of the difficulties. Then there is about 250m of hard climbing. 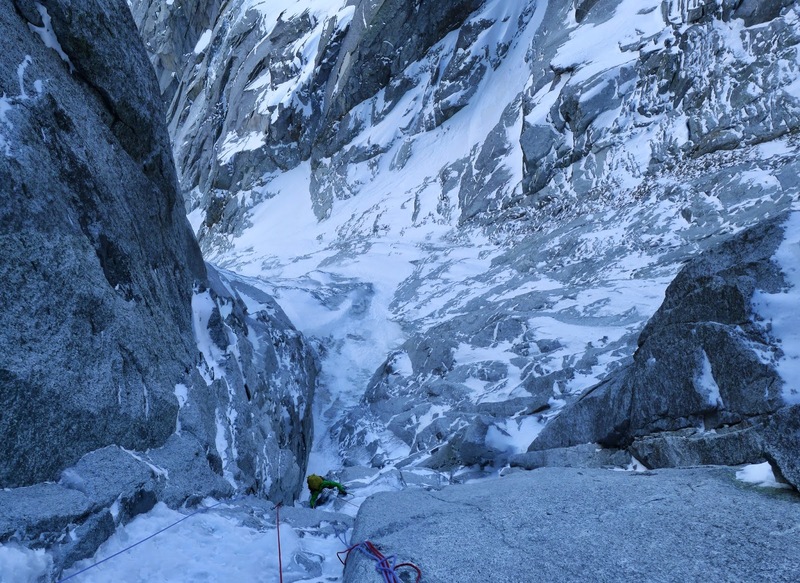 We climbed it in 4 pitches, and I find it best to describe it in Scottish Winter grades. P1;VII,7 P2;VI,5 P3;VII,7 P4; VII,8. These Are just my thoughts, and would be slightly harder in fresher conditions, as the ice was nicely hooked out for us. Nevertheless still very pumpy climbing. After the Difficulties you have the main section of the Dru Couloir. about 300m of 65 degree ice. 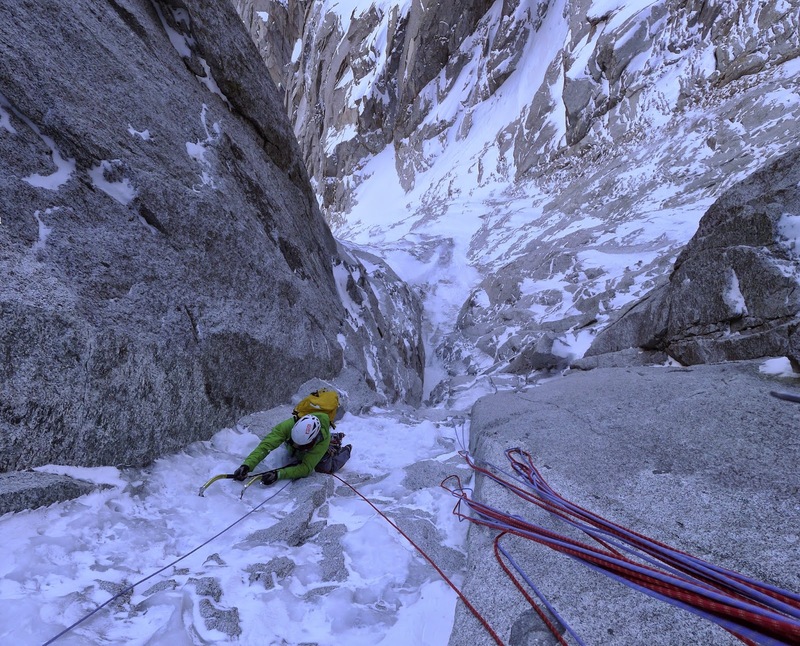 Which has a steep step straight after the hard pitches, then another step at the 'S bends' of the Couloir. Calum enjoy the very chilled bivvy spot. Last bit training with the Cabin crew. Due to the amount of people climbing the route recently there is a lovely track to the bivvy spot and to the bottom of the route. 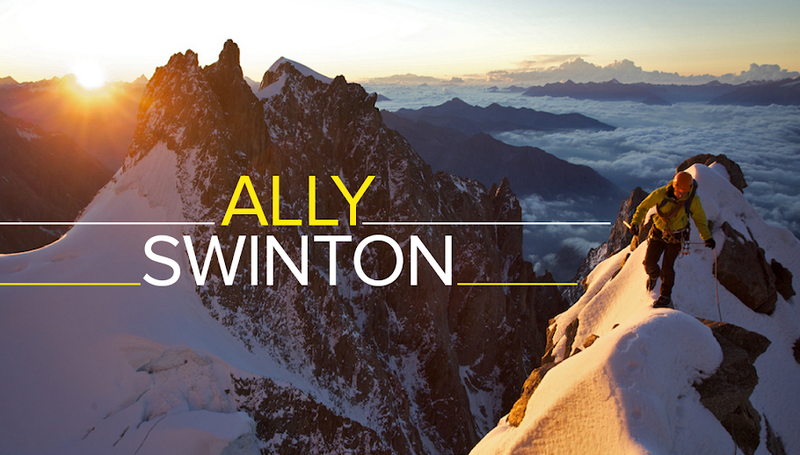 The bivvy spot is very pleseant with awesome views of the Dru, Mt Blanc and over Chamonix. We got into our bags early but unfortunately it was snowing slightly, and I didn't have a bivvy bag. So I had to keep shoogling to flakes of my bag. Nobody likes damp down. We woke and after making our breakfast and downing some liquid, set off for the route just after 5am. I was so pleased that no one else was going for the route that day. It just takes so much stress out of the situation. Calum settling in for the night. After the Bergshrund it was into climb mode. Uncoiled both the ropes and I tied onto the top ends. Like I said earlier the first 300m slopes were simul climbed. As the slope curves right you get your first sight of the difficulties. It's basically a 200m chimney/slot with a steep icy finish. I carried on up the ast 100m of slopes to the first belay at the bottom of the difficulties. Calum at the end of the initial slopes. My head sometimes wins a battle that I fight with it at times, and when it does I just freeze up and can't climb. When I got to the first belay and was bringing up Calum, I felt good and just wanted to carry on climbing. The first pitch started off with a steep wee chimney that was maybe about Scottish V,5 to a ledge. It then carries up over a steep bulge. The cracks in the bulge that climb are pretty poor and most of the time your hooking on small flakes of rock. Very tenuous climbing that I thought was about Scottish VII,7. Happy to be first hard pitch down. Calum on the crux bulge of the first pitch. Calum grab the kit, ditched the bag and carried on with the second pitch. It looked fairly straight forward, but the protection wasn't the greatest and had a few awkward moves. This brought us to below the main part of the route, and it steepens up quite a bit. I took the third pitch on. Which I heard was meant to be pretty bold, however I thought the protection on the whole route was really good. The pitch consisted mainly of a few grooves at the bottom then a main chimney/groove that has a ice runnel at the back. The pitch was almost a full 60m. I was trashed at the end of it. Forearms and biceps were cramping up like mad. Bringing Calum up gave me plenty of time to look at the final crux pitch. Sometimes I'm like a wee kid. Actually I'm always like a wee kid, but what I'm trying to say is that I always want what everyone else has. So now that i knew Calum was getting this final pitch, which looked amazing, I wanted it. Calum was nice enough to offer it. However I was struggling to take the rope in through the belay device due to cramping arms, so it was probably for the best that Calum climbed it. Calum near the top of the third pitch. Caum swiftly grabbed the remaining gear from me, which I think was a carabiner due to using all the kit on the previous enduring pitch. He climbed the final pitch really well. It mainly consists of a chimney that you press your back against, whilst torquing your right axe and crampon in a crack and hooking and pushing with the left side. Eventually the chimney stops and your forces you out onto a smear of ice on the right wall, then you have to pull out over a bulge of ice at the same time. Thankfully it was pretty well hooked which makes it feel slightly more comfortable, don't get me wrong it still pumpy as hell. the climbing was wild and pumpy, but like I said earlier, I thought it felt pretty well protected. So I thought the final pitch was maybe Scottish VII,8. If it was in leaner or fresher conditions I could imagine it being VIII,8. Calum couldn't resist getting a picture of me. Can't blame him. Calum on the ice at the end of the pitch. Bit of exposure on the crux ice! Myself exiting the crux ice pitch. At the belay at the end of the crux pitch. After the steep mixed climbing it was just ice for the next 300m. The first pitch after the cruxes, was a small steep wall of ice. Looked relatively easy, but once I get involved it was a wee bit more than what I thought. The ice/neive was pretty poor, and now the cramp in my arms had come back. I took my time climbing through that section. The cruddy ice section after the mix pitches. Calum following at the end of that pitch. Calum was nice enough to take over for two pitches to give my arms a wee break. 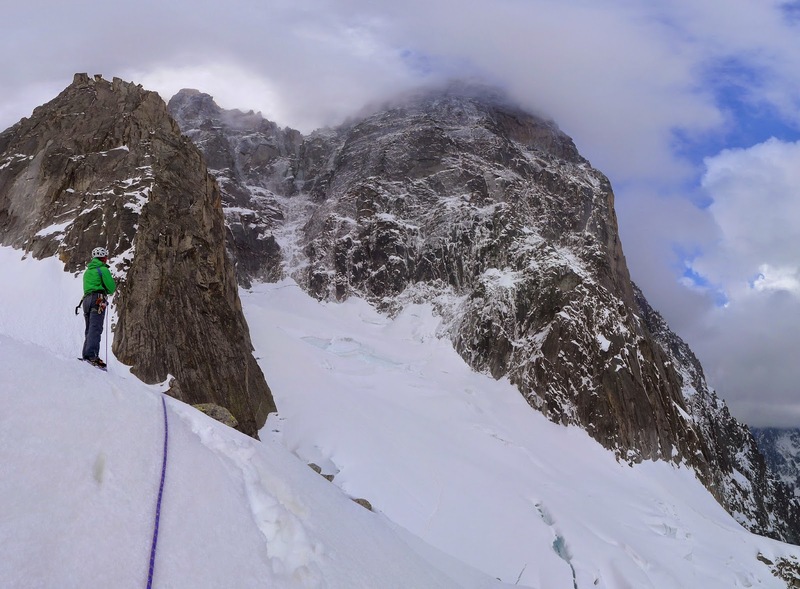 One really cool thing about this upper couloir, is that we abseil back down the exact same way. So we just clipped the bag, with all the mix rack, onto one of the lower in-situ V-threads. Then we'd collect it on the way back down. 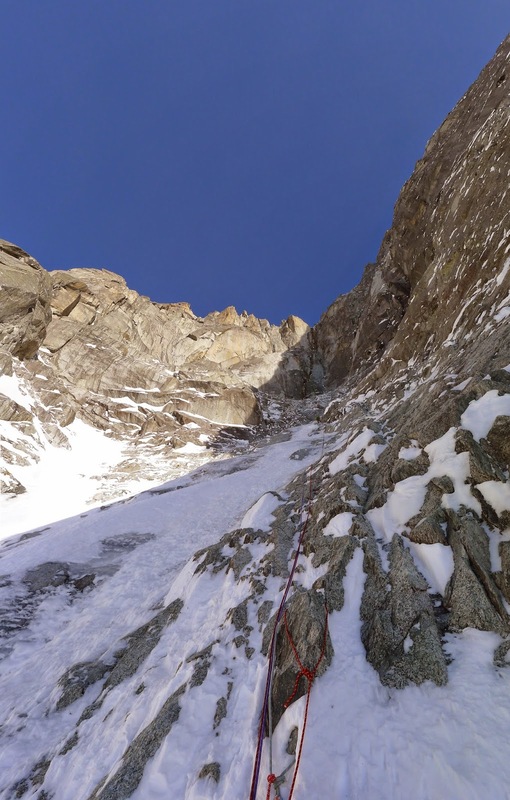 The upper couloir is fine, but it's just very tiring constantly climbing at the same angle. We reached the top at 5.30. So we pretty much took about 12 hours, which isn't the fastest. 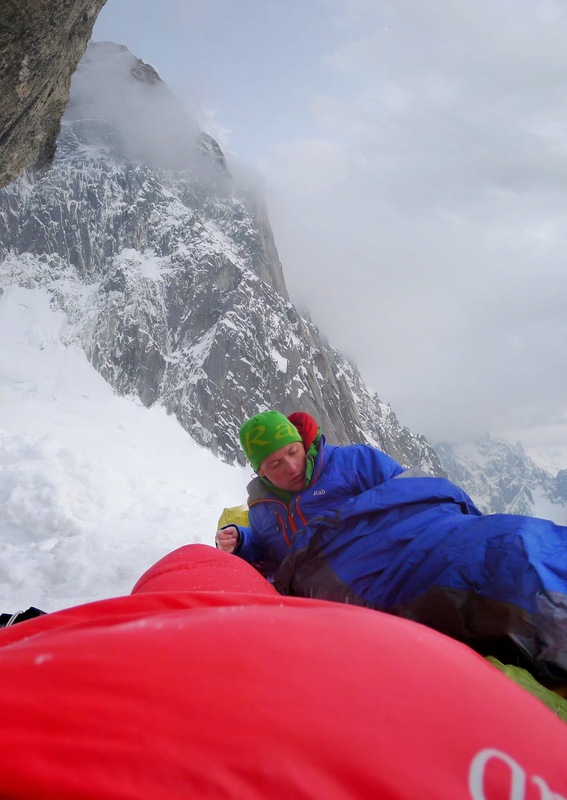 But Calum had just done the Eiger two days previous and I'm... well... I'm just me! It's a great route to rap down, as everything is already in place. Which means you get down very swiftly. We were back at the bivvy spot for 7. Then we had the slog back up to the GM top station. It's probably one of the coolest routes I've ever climbed. 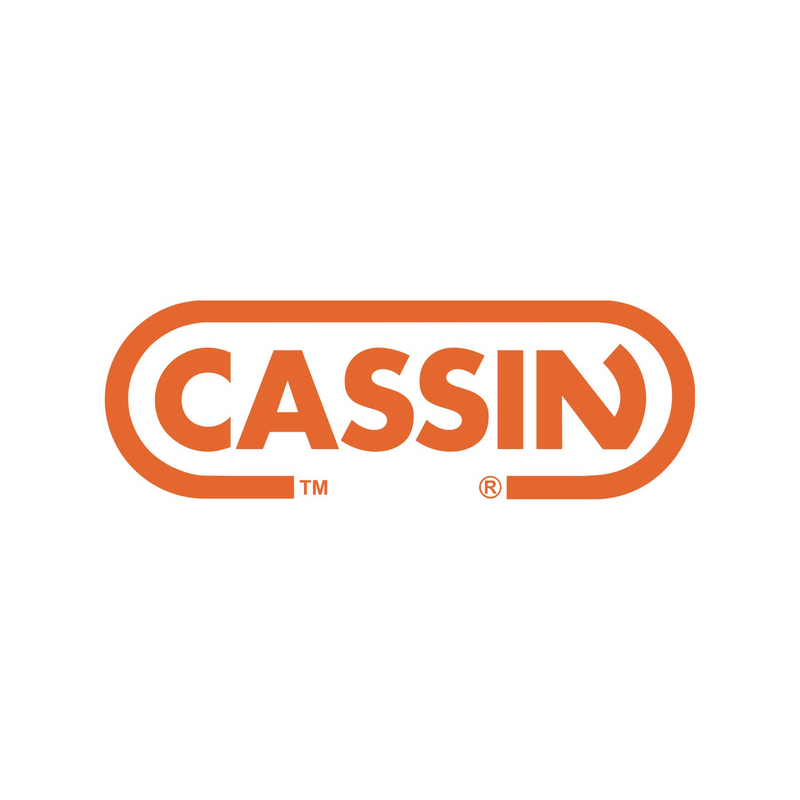 Cheers Calum for the fun. Evening light on the dru. Thanks, Very proud line indeed.